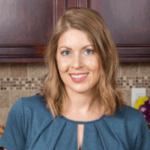 Published: Dec 4, 2015 · Modified: Apr 22, 2018 · By Jen Sobjack · This post may contain affiliate links. 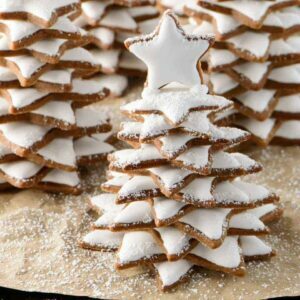 Soft Snowy Gingerbread Christmas Trees make a wonderful holiday gift. Here we take a traditional Christmas cookie and turn it into a fun and magical gift. Not only are the cookies fun to make, they are even more fun to eat. Pop off each section and enjoy the tender cookie without having to soak it in milk. The recipients of this gift will surely be impressed when they take one look at these gorgeous cookies. This post has been sponsored by Bob’s Red Mill. All thoughts and opinions are my own. I mentioned earlier this week how crazy it is that Christmas is almost here. Are you getting ready? Remember several months ago when I mentioned that we began a Christmas tradition of going on a cruise every year? Well, my inlaws sort of invited themselves along this time. At first, I was a little upset because I was looking forward to time alone with my main squeeze. But I’ve come around, and I think it will be fun to have someone to share our adventure with. Each year I make gift bags full of goodies to send to family. This makes up for our absence during the holidays and everyone has come to expect delicious baked goods arriving in the mail. My chewy ginger snap cookies are usually included, but this year I’m switching it up. I’m making Snowy Gingerbread Christmas Trees instead. The recipe is quite different since these are cut-out cookies. The dough needs to be sturdy yet soft and pliable. That’s where Bob’s Red Mill comes into play. 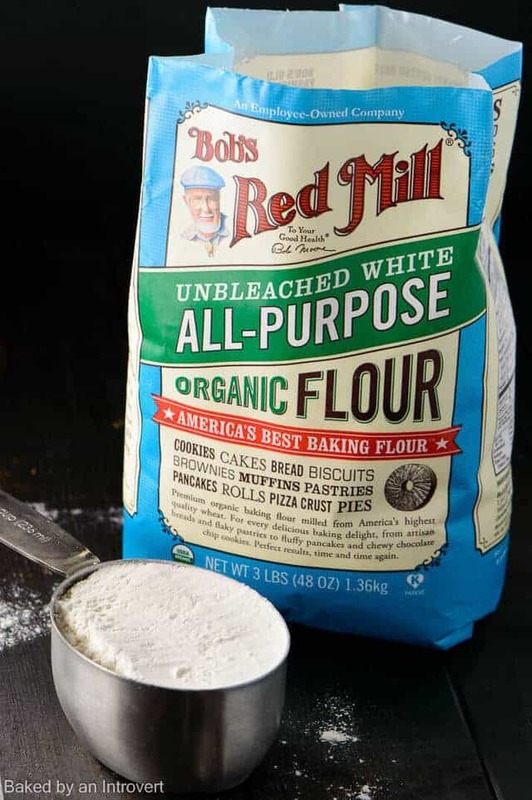 Bob’s Red Mill Organic Unbleached All Purpose White Flour is freshly milled from organic hard red wheat with no additives, making it a great choice for baked goods. White flour doesn’t contain the bran and germ, instead, it is made from the endosperm. It has the same high protein as flour used by professional bakers and produces well-textured loaves as well as light and airy baked goods. The texture of the cookies turned out phenomenal. The cookies take a while to prepare and the recipe makes a lot of cookies. You’ll need a set of 6-star shape cookie cutters that range in size from 1-3/4 to 3-1/2-inches. Roll the dough out into a thin layer in between two sheets of parchment paper and freeze it for 20 minutes. This makes the dough firmer and easier to handle while cutting out the stars. You will need meringue powder for the icing. You should be able to find this in the cake decorating isle of your local supermarket or at a craft store. 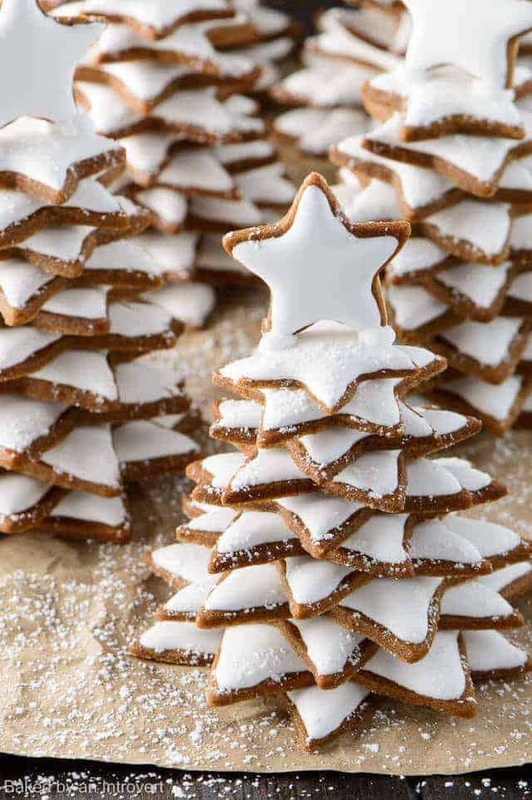 Have fun and enjoy the process of making these snowy gingerbread Christmas trees. It just may become your new holiday tradition. Please enjoy this coupon for Bob’s Red Mill. 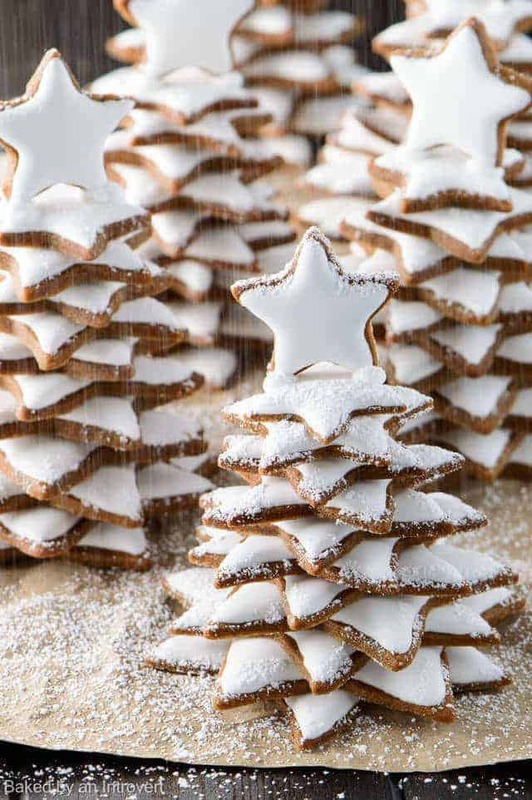 Soft and chewy Gingerbread Christmas Trees make a wonderful holiday gift. Here we take a traditional Christmas cookie and turn it into a fun and magical gift. Not only are the cookies fun to make, they are even more fun to eat. Pop off each section and enjoy the tender cookie without having to soak in milk. The recipients of this gift will surely be impressed when they take one look at these gorgeous cookies. In the bowl of a stand mixer fitted with the paddle attachment, add the flour, sugar, cinnamon, ginger, cloves, and salt. Stir to combine. Add the butter and mix on medium-low speed until the mixture resembles wet sand. Reduce the speed to low and with the mixer running, slowly pour in the molasses and milk. Mix until the dough is thoroughly combined. It should be the consistency of play-doh. Scrape the dough out onto a clean work surface and shape it into a disk. Divide the disk into 4 equal portions. Roll one portion at a time in between 2 sheets of parchment paper to 1/8-inch thickness. Leave the dough in the parchment paper and stack it on a cookie sheet. Freeze the dough for at least 20 minutes to make it easier to handle while cutting. Adjust the oven racks to the upper and lower middle positions. Preheat the oven to 325ºF. Line two baking sheets with parchment paper or a silicone mat. Take one sheet of dough out of the freezer and gently peel off one side of the parchment paper. Place the parchment paper back into place and flip the dough over. Peel off the second sheet of parchment paper. 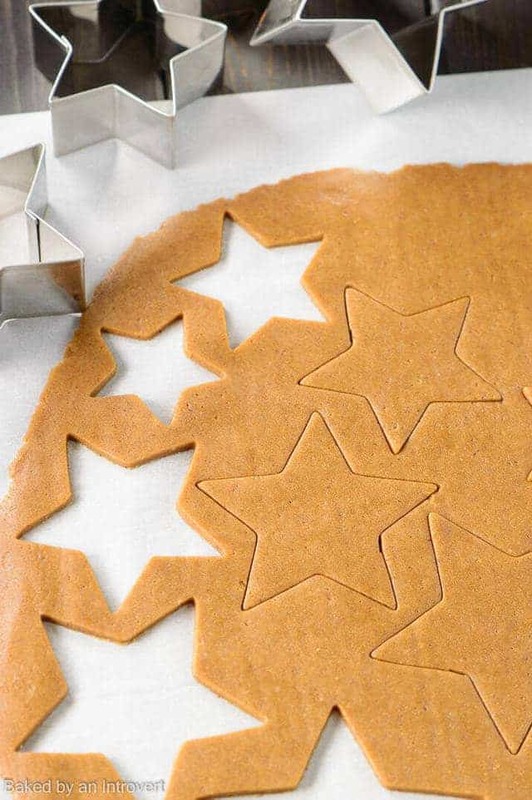 Using multi-size star shape cookie cutters, cut equal amounts of each size. Transfer the cookies to the prepared baking sheets, placing them 1/2-inch apart. Set aside the scraps. Repeat with the remaining sheets of dough until the cookie sheets are full. Bake for 15 minutes, rotating rack positions halfway through. Don't over-bake the cookies, they will be done with the have darkened slightly. Let cool on the pan for 2 minutes before transferring to a wire rack to cool completely. Combine the remaining scraps and repeat rolling, freezing, cutting, and baking until all the dough is used. In the bowl of a stand mixer fitted with the whisk attachment, combine 1/2 cup of the water, lemon juice, and meringue powder. Stir to dissolve the powder. With the mixer on low, gradually add the powdered sugar. Turn the mixer up to medium-high speed and beat for 5 to 7 minutes, until glossy and stiff peaks form. Set a small ziptop sandwich bag inside of a coffee cup or small glass with the opening folded out over the rim of the cup. Fill it with about 1 cup of the meringue mixture. Seal the bag and set aside. Add 1 teaspoon at a time of the remaining water to the meringue in the bowl, stirring with a rubber spatula after each addition until the mixture resembles glue. It should fall in a ribbon from a spatula. Add liquid or gel food coloring if desired. Pour some icing into different bowls if using multiple colors. The icing needs to be used right away or transferred to an airtight container. It will harden as it is exposed to air. Decorate the tops of the cooled cookies. Squeeze bottles work great for this. Allow the icing to harden before assembling the trees. Cut a small amount off the bottom corner of the sandwich bag containing the icing. 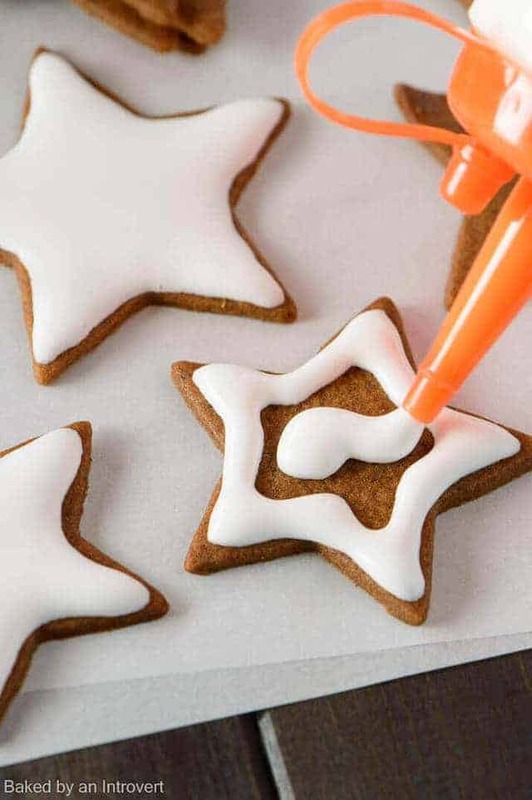 Starting with the largest size star, squeeze a small amount of icing on the center. Top it with a second star of the same size, offsetting the corners so they are not lined up evenly. Repeat the process with the next smallest size star. Use 2 of each size star and work your way up to the smallest star until the tree is assembled. Let the trees dry for 24 hours. You can use more layers when building the trees if you desire taller trees. You don't have to use star shapes for the trees. You can use circles or any other round shape with fluted edges. Sounds like a nice way to give something to the neighbors and friends – looking forward to trying the recipe out. Beautiful! These look truly stunning. I’d love to make a set of these for my table centerpiece! So pretty! I bet your gift bags are delicious! Thanks, Kelly! I love gingerbread! It wouldn’t be the holiday season without it. Oh Jen. . .I absolutely adore these Christmas tree cookies. I am planning on making something similar later this week. I can only hope mine come out as lovely as these. But if they don’t work, I know where I am going for my back up plan because these would make excellent gifts. And how much fun are they to eat? That said I’m not sure I would be able to control myself and before you know if. . .a whole tree would be gone with the wind. EEEKS! New pants for Christmas please. Btw. . .hoping you have an even more magical time on the cruise with your in-laws. Good luck with your recipe, Lynn! I’m sure yours will turn out even better than this! These look super cute and perfect for the holidays! What a fun idea! Love the pictures! Thank you so much, Mira! What a fun idea! So festive! Okay, these are seriously SO cute!! I absolutely adore them and wish I made things as cute as these, haha! These are such a perfect gift. Thanks, Rachel! I’ve seen your recipes, you make some pretty darn good stuff! These are complete holiday perfection! I’m in love! I love all Bob’s red mill products Jen and love this idea of making a tree with cookies!! GENIUS and so beautifully done!! I am officially hooked on this flour. It yielded such fabulous results. They tasted so good! The hubs kept trying to eat them all!! These are the best decorative gingerbread cookies that I’ve seen in a long time, Jen! I absolutely love this! What a great idea to frost and make them into trees. This would make such a fun Christmas gift! Thank you, Gayle. I had such a great time making them. Thank you for the sweet comment, Thalia! What a great way to use gingerbread! These Christmas trees are adorable, I love them! Those would be so fun to make with the kids! These cookies look amazing! Love the decorating 🙂 Pinning! They were a lot of fun to make! Thank you for the pin! Oh these are so so pretty Jen! Absolutely love the last shot with the powdered sugar ‘shower’! Thank you, Manali! I had so much fun making these.